Learn how leading palaeoartists interpret new research to depict the beasts of the prehistoric world. 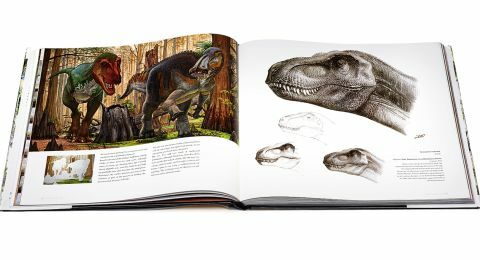 For fans of dinosaur art there's plenty to learn here, with in-depth insights from the world's leading palaeoartists, plus lots of great examples to look at. However, it might be confusing for new fans. Mastering how to draw dinosaurs is a mix of artistry and scientific accuracy. On the one hand, scientists have discovered clues as to what these prehistoric beasts looked like from fossils and other evidence. But when it comes to texture and colour, we have no way of knowing for sure, so guesswork and imagination must also play a part. In this way, a discipline known as 'palaeoart' has grown up over the years, working in a feedback loop with palaeontologists to bring their discoveries to the wider public through books, magazines and science papers. Steve Wright’s second book devoted to dinosaur art showcases the work of 10 major names in this niche field. Alongside the art itself, lengthy Q&As with each artist get to the bottom of how they carry out their research, their views on current scientific controversies, and the processes they use to create their art. If your knowledge of palaeontology is limited, you might get a bit lost: there’s just a short glossary that’s not particularly comprehensive. Yet anyone who loves dino art – or just dinosaurs in general – will find this a fascinating read. This article was originally published in ImagineFX, the world's best-selling magazine for digital artists. Buy issue 156 or subscribe.